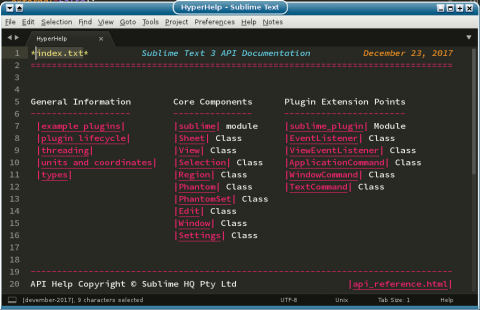 If you’re not sure what that might be, you may want to compare it to the Sublime Text 3 API Reference page. Before you ask, no it’s not automatically generated (not yet, anyway). Much like hyperhelp itself, another side project that I was previously working on was something called SnAPI, which is meant to be the Sublime API presented in a quick (snappy) manner. SnAPI uses hyperhelp to present the Sublime Text 3 API reference in order to refer to things easier. Besides being a useful API reference this was also the reference project for a more full scale help package. Development on this got stalled out when it became clear that hyperhelp needed more functionality than it currently had, which was tricky to add based on some early design decisions made during the initial prototyping phase. Those problems are why I decided to reboot the project from the ground up this Devember in order to fulfill the new design goals. Since the core of the help is from a few months ago, the documentation presented does not include the latest additions this development release series like the classes for the new command palette input mechanism, but that will come later. In the meantime a lot of changes had to be made to the index file to support the new index format, and the help files were split and massaged as well in order to take advantage of the new features. I think the experience overall is much better now than it was before. There are some new code changes here to support the idea that a help package can provide it’s own template to use for the caption of a help topic that doesn’t have one explicitly defined. This is of great use here in this package, where there are a ton of anchors and most of them are API endpoints that it would be tedious to hand caption. I have a few changes lined up for tomorrow as well as some bug hunting (which comes first), but since tomorrow is Christmas Eve and I will be attending a party, I would imagine that the coding session would be a strict hour and the devlog short and sweet.